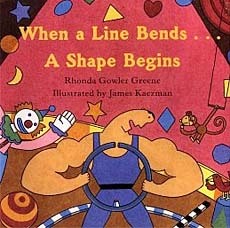 In When a Line Bends A Shape Begins, bouncy verses describe and show 10 shapes that can be created by the simple bending of a line. Each vibrant spread is devoted to a different shape and is packed with examples. Shapes include squares, ovals, rectangles, triangles, diamonds, circles, stars, crescents, hearts, and octagons. The illustrations are adorable, and the many real-world examples help kids see shapes in the world all around them. Publishers Weekly called it a "clever and fun introduction to assorted shapes" and School Library Journal called it "a fine addition to units on shapes and a perky read aloud." 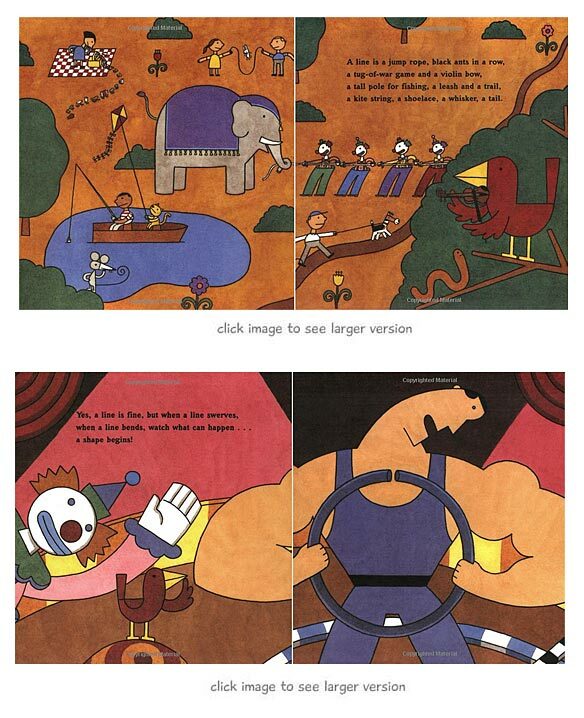 Below are sample spreads from inside this book. The first spread is devoted to squares. The text references the examples of squares included in the illustration. Kids will love finding the different examples as your read the rhyme. -Take a shape walk--Take a walk through the building or outside and have the students tell how many different shapes they see in everyday things around them. To access the full instructions for these activities, visit the author's website here.